The VAN Booster type Hydro Fill System fits in well with your modern building. Considering the following features. Fully assembled. The package is ready to use after plugging into your Control Panel & connecting solenoid valve in your overhead tanks. The solenoid valves selected are of Industrial quality having long life. No operator is required. Fully automatic System works maintenance for years. Once the system is kept in Auto position, the pump starts filling all overhead tanks. 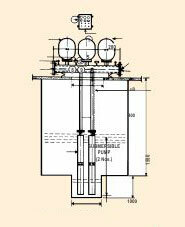 When each tank is full, the solenoid valve close the incoming water. When all valves are closed sensing low flow, the pump stops. The pump will restart when any of the tank levels go below low level The line surges during each stopping of pump will be absorbed by diaphragm tank.